I have just acquired a secondhand yew Timbertops chair wheel. More about it later, but meanwhile, here are some pictures. When I started spinning I bought a new Ashford Traveller, but now my DH has started spinning too, so we had to get a second wheel. We got a cheap second-hand Ashford Traditional, and now I usually use that while he uses the Traveller. We do quite a few spinning demos, mostly for the guild, though we have not done as many lately. Some of our most interesting demos have been at the Silchester Roman dig where we were teaching visitors to use low whorl spindles, as well as demonstrating the warp-weighted loom. I really enjoy spinning, but I haven't made a lot with my own handspun yarn, mainly because I tend to be so excited by new fibres that I have a lot of sample skeins, but not enough of any one type to make a sweater. I am rather pleased with the 'sample bears' that I've made based on a pattern from Spin-Off (from their spindle special, now sadly out of print). This is Jeremy, who I made for an American friend, Laura, using my own handspun for Jeremy himself (Shetland, woollen spun) and making his vest from her early spindle-spun yarn. 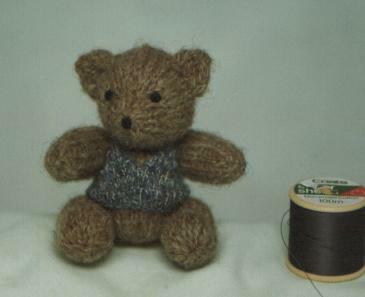 I'm planning to make a similar wee fella for myself from the same two yarns to be my 'wheel mascot' and come to demos with me as a symbol of how much my learning to spin at all is a product of US/UK collaraboration. 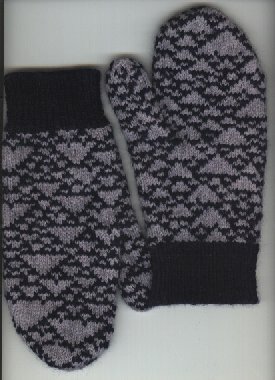 These mittens were made for a guild challenge - "Inspired by a Shell or Stone". 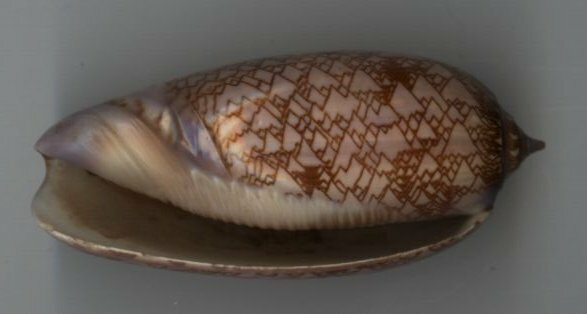 My inspiration was the Tent Olive shell shown below. They were knitted from yarn I spun from commercial merino top.